Plasowin uPVC Doors & Windows brings tranquility and cut unnecessary disturbance especially favored & widely used in Hospitals, Schools and office buildings. Moreover, after a day of hard work, you deserve to go home with best protection from exterior noise. Plasowin uPVC Doors & windows are overlapping systems with EPDM and wool pile being put in all places which ensure that the windows are Air Tight hence reducing Noise coming from outside. Most of the other windows available are not overlapping systems so there gaps always between the Frame & the sash hence allowing noise to come inside from outside. 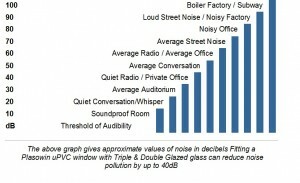 Below is a reference chart which gives an idea of the Noise level for various things. 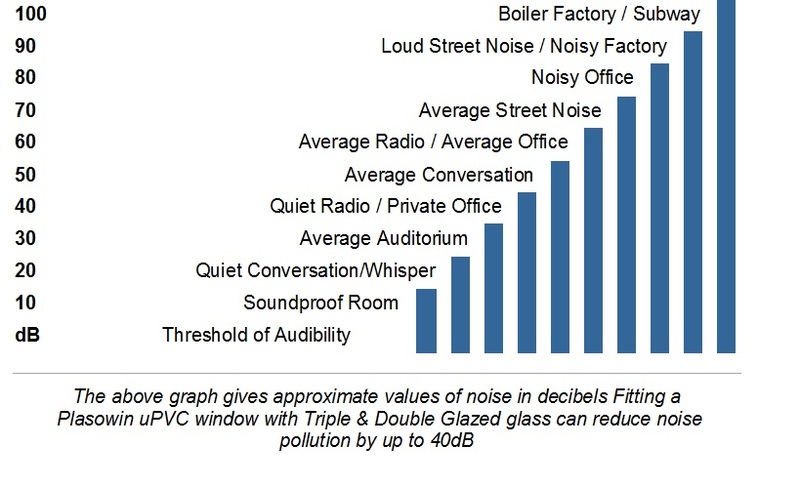 By using Plasowin uPVC Doors & windows you can reduce the Noise levels by 40 decibels.